Fairbanks' Annual Flying Moose Turd Contest! Fairbanks, Alaska 10-Sept-2005 [JP]: Max the Moose, mascot of Denali State Bank, along with dozens of spectators, witnessed Fairbanks’ first Moose Nugget Drop for Diabetes, an event the Fairbanks Rotary Club hopes to be an annual - and uniquely Alaskan - fundraiser. 2,000 dried and numbered Moose nuggets were dropped 100 feet from a fire truck onto a large, painted target at Kiwanis Field. Rotary members sold tickets, each with a number representing one of the nuggets, with proceeds going to benefit Fairbanksans with diabetes. The 53 ticket holders whose nuggets landed closest to the bull's-eye won cash prizes. Fairbanks Rotary Club president Barbara Schuhmann pitched the idea to the club after hearing about a similar & successful event sponsored by the Anchorage Rotary. Since it was her idea, Schuhmann was charged with collecting the necessary specimens. Schuhmann said it took about a week to collect 2,000 moose Nuggets – something found in abundant quantity in Fairbanks. She initially used an outdoor smoker to dry the nuggets, but her family started complaining when she left them in the sun room. With tender care, the nuggets were then shellacked twice to ensure they could survive a 100-foot drop with minimum damage or dispersion, and painted with a number. "They’re pretty bomb-proof," Schuhmann said, sporting a dried glossy example of her handiwork pinned to her lapel. Rotary member Bob Howard, the official in charge of the fundraiser, used a bullhorn Saturday to keep spectators away from the target and warned anxious kids itching to pounce on the nuggets they would have to stay a safe distance away once the prize-worthy nuggets were dropped. 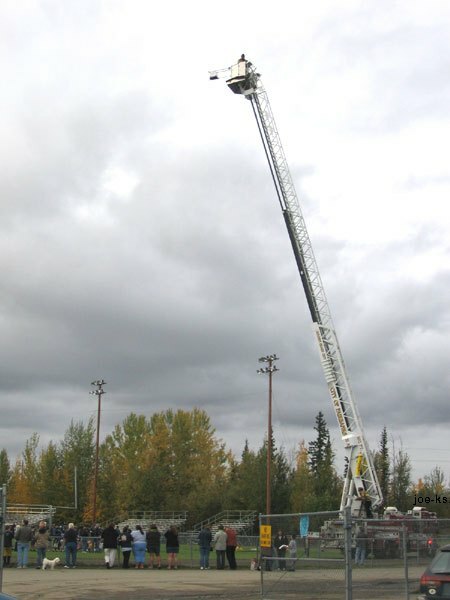 At the stroke of 5 P.M., firefighters with the Fairbanks Fire Department released the nuggets from atop a 100-foot-tall ladder. With a slight breeze blowing, the lot seemed to favor the right side of the target. They each bounced once, and all kept their shape. The winning nugget, worth $5,000, landed about 19 inches from the bulls-eye. After the event, the nuggets were collected - if they survive a year in storage, they’ll be used again next year. The fundraiser sold 1,800 tickets in three weeks, and Schuhmann hopes to sell more tickets next year. This year's proceeds will be distributed among several diabetes organizations for research, support and education, with some of the money set aside for scholarships for a diabetes camp. 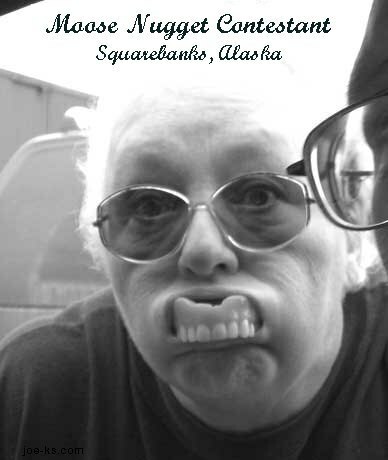 Howard estimates that 7,000 people in the Fairbanks area live with diabetes each day. Thanks to staff writer Margaret Friedenauer of the News Miner (www.news-miner.com) and Bob "MoSkeeterz" Carroll. Post Note: Sounds like a real bum deal but a GR8 fundraising event for a very worthy cause! In Cranbrook, B.C. they have a similar abundance of elk cookies… The Joe-kster would like to know if anyone there is interested in gathering, shellacking & painting a few elk cookies for your own annual event? Wait ‘til the residents ‘get wind’ of your idea, eh! Post-Post Note: News just in from Wyoming where a recent "Cow Pie" contest turned a little messy... 'pie in the face' come to mind? Post-Post-Post Note: It’s not a good idea to eat the proceeds from these events… this is what happened to one lady who couldn’t wait to benefit from the moose nugget leftovers! Wired Moose - Bull Moose Hanging From A Power Line?